I've come too far to quit now! I love my state, it’s great here most of the time. 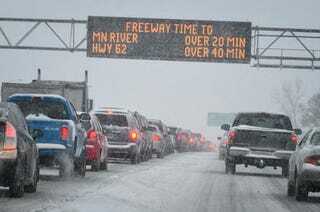 Just because it took over an hour to travel less than 10 miles to work and there were a total of 12 accidents on the way does not mean it’s like this every day. We are hearty northerners, we are used to this stuff. And just because it sounds like Minnesota passive aggressive doesn’t mean it’s not Minnesota nice. It’s really not that bad; but after 30 minutes in crawling traffic there is that moment of having to figure out if you’ve come too far to quit, or if hot cocoa at home is worth turning around for. Tell me about times when you’ve gone too far to turn back around.